My paintings are a response to the almost tangible, radiant light that has become synonymous with St. Ives and the local area. 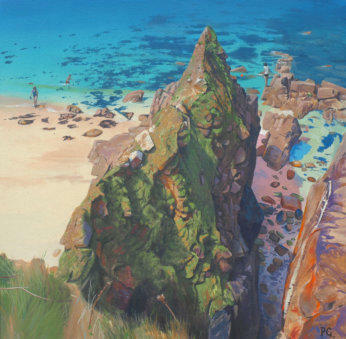 They often attempt to capture the heavy, atmospheric, almost theatrical glow that you occasionally find along the Penwith coastline on a sunny day. 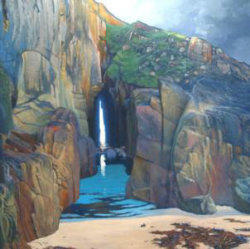 This part of the Cornish coast is well known for its exceptionally clear and sometimes dramatic quality of light. It seems appropriate, therefore, that I should start with a dark background and proceed to add the light. 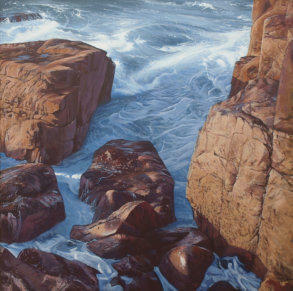 Initially through wet on wet (keeping the canvas damp with the aid of a water diffuser), a sense of light is added gradually by ‘scumbles’ of paint, often applied with a rag. Glazes are used to tone down areas that have become too light, building up layers until a satisfactory resolution is acquired. Small details and accents can then be added to the dry surface to provide clarity. 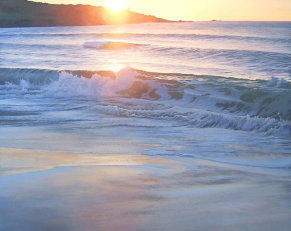 Living in St. Ives my subject matter is perhaps naturally, the coastal scenery of the Penwith Peninsula. I am particularly interested in scenes where man made structures combine with the natural environment. 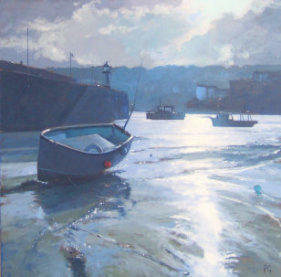 Harbours, boats, piers and lighthouses are a recurring theme. Painting on a canvas primed with a finely textured acrylic ground, adds an interesting quality to the brushstrokes as the paint is dragged across the surface. Painting onto a dark background, applying areas of light onto the surface of the painting, I feel that I am creating a sense of space and form using light, rather than building with shadow.